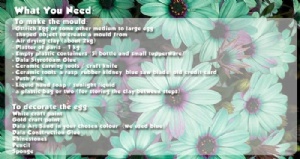 a) Cut the top off of the 5l plastic bottle and start packing clay into the bottom of the bottle. 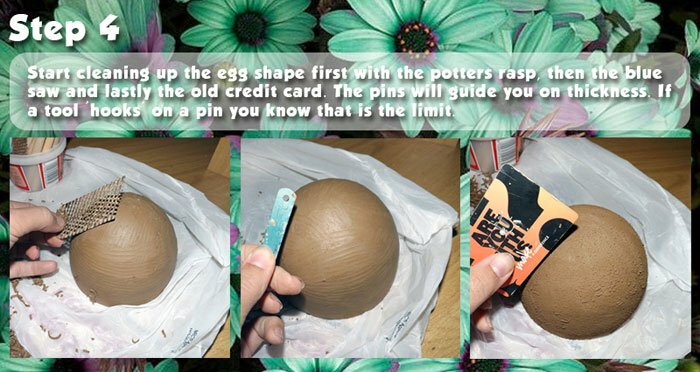 Add enough clay to submerge the ostrich egg / your egg shape half way into the clay, and then push the egg half way into the clay so just its top half id sticking out. 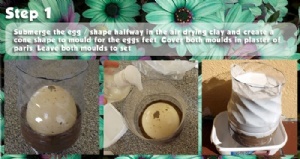 b) Coat the exposed surface of the egg with the liquid hand soap - this will act as a release agent when you remove the egg/shape from the mould. c) Roll a small cone shape about 2 - 3 cm tall and place this into the small plastic container flat side down. This will form the mould for the eggs feet. d) Mix the plaster of paris up (1 part plaster to two parts water is the general rule) and pour into the 5l bottle over the egg in the clay. Pour enough over the top for there to be a thick 'base' for the mould. e) Then pour some plaster over the small cone shape and allow both moulds to set. a) Once the plaster in the moulds has set (half an hour) you can cut the plastic away from the egg/shape and cone moulds and then remove the egg / shape and cone so that all you have is the plaster mould. 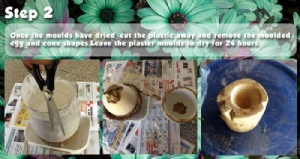 b) Leave these plaster moulds out to dry in the sun. It is advisable to allow plaster to dry out for 24 hours before using it. 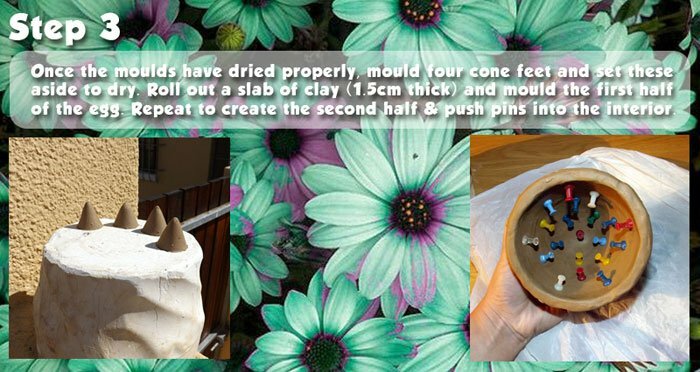 a) Once your moulds have hardened overnight / or for 24 hours, press four cones into the small mould and let them dry in the sun. 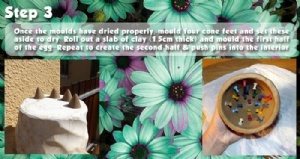 b) Roll out a slab of clay, about 1.5cm thick, and press into the large mould for your first half of the egg. Once it is a "leather hardness" you can remove it from the mould and place it in a plastic bag so that it doesn't dry too quickly. 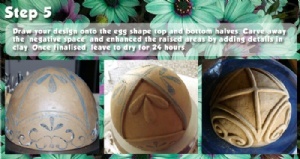 c) Then roll out a second slab, same thickness, and make the second half of the egg mould. Wait for it to reach a "leather hardness" and then remove this half as well. d) Push pins into the inside of this egg half as shown. 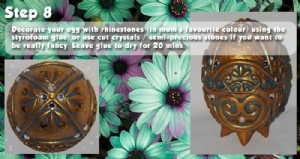 These will act as a guide when you are cleaning up the egg shapes in step 4.
a) Start by cleaning up the shape's exterior with the potters rasp. b) Continue to clean it up further with the blue saw and lastly with the old credit card. c) The pins serve as a guide for thickness. When you feel a tool hook onto one of the pins you will know to stop. a) Use a pencil to draw an interesting, symmetrical design on the egg's top and bottom halves. b) Once you are happy with your design, begin to carve away the areas that will be "negative space" with your ceramic tools / craft knife. Take care not to carve too deeply. 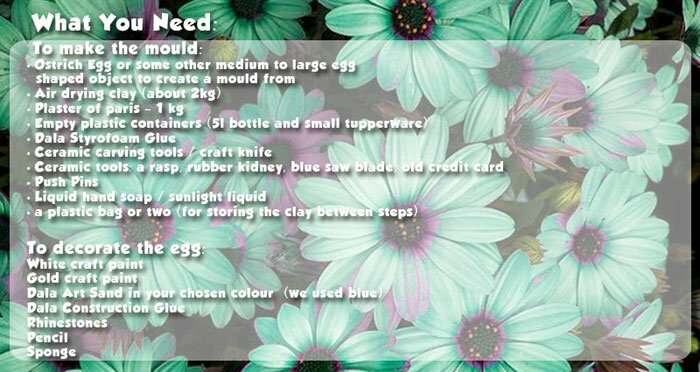 c) Then, to enhance the detailed areas you could mould small shapes to stick to the egg to perfect the raised portions of the design. 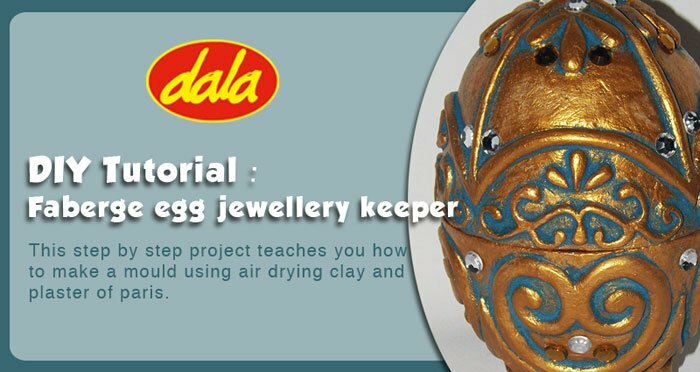 d) Once the entire egg has been carved and decorated with the air drying clay it must be left to dry thoroughly. Leave it for 24 hours. 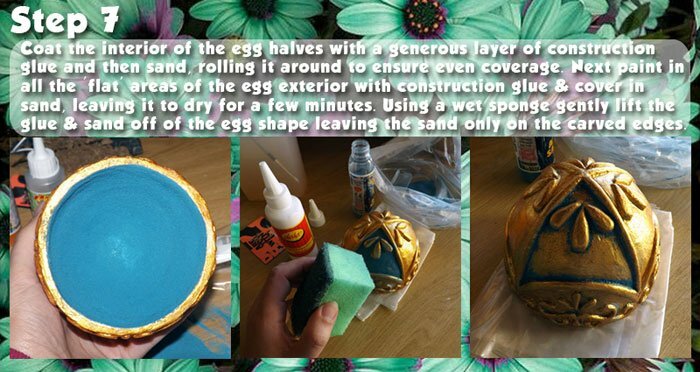 e) Once the egg is dried thoroughly, use some Styrofoam glue to stick the feet onto the egg how you see fit - ensuring the egg is level and stands straight. Wait for the glue to dry for a half hour. 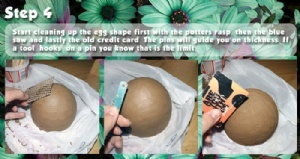 a) Coat the entire exterior of the egg in a solid layer of white craft paint. 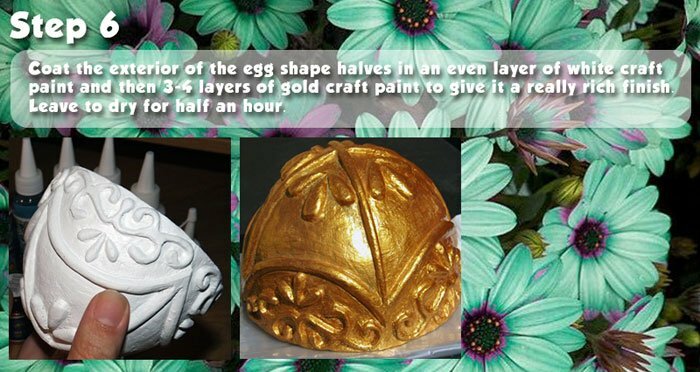 b) When that is dry, begin to coat the egg in gold craft paint. A few layers will yield best results - we did four layers. Leave this to dry for a half hour. a) Coat the interior of the egg halves with a generous layer of construction glue. b) Then pour in a handful of sand into each of the halves and roll the sand from side to side, over the glue until coated. Decant the excess sand back into the bottle. c) Paint over all of the 'negative space' in the design (all the flat areas) with a layer of construction glue and cover with coloured sand. d) Leave it for a while to get tacky, but before it dries use a wet sponge to pick up most of the sand and glue leaving sand only on the carved edges. Continue until a desired look has been achieved. Leave to dry for a half hour. a) Decorate the exterior of the egg with rhinestones in your chosen colours or perhaps glitter. This item has 715 views.